Next Post → what’s this all about? 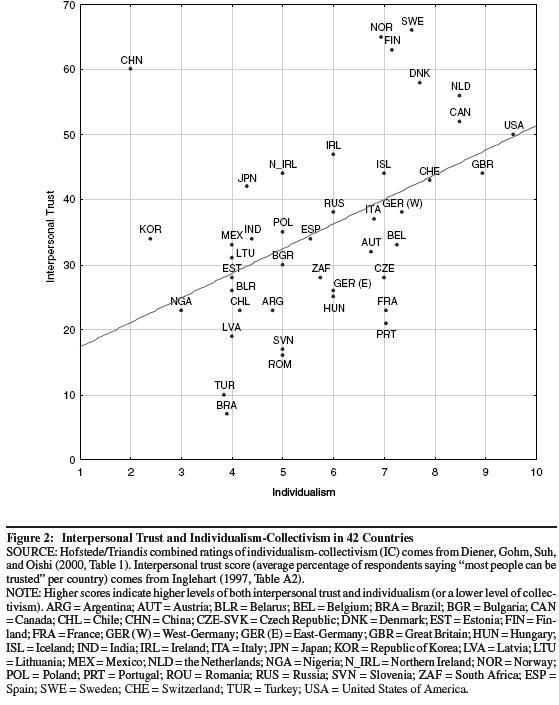 Their interpersonal trust measure they use in in their correlation between individualism-collectivism is interesting. It’s surprising that a lot of the Northwest African Arabic countries are amongst the lowest trust, whereas the Arabic countries along Northeast Africa, West Asia and the Arabian Peninsula were pretty high trust, often more than the typical European country. I don’t have much experience with Iranians, but apparently that matches perceptions of their personalities. I think that’s right. Kin-gravity *prevents* the creation of larger scale social networks and that was the first step initially. However I also think both are true i.e. *initially* it got started the way you have described and that led (imo) to the industrial revolution and urbanization model in NW Europe but as that industrial *model* was exported to non-individualist populations the people in those countries who moved from the country to the cities because of the model began the individualization process simply through people from different villages moving to the city and getting married. They didn’t adopt the individualist marriage model deliberately it was simply a side-effect of the internal migration to the cities. This would be true everywhere except places where the original clan-based marriage form continued through long distance arranged marriage. The individualist creating process in the original variation has had a lot more time to work. In the exported model variation it’s more of a crash course. I think you see the effects of variation (2) in many places – the riots in Turkey being a current example. 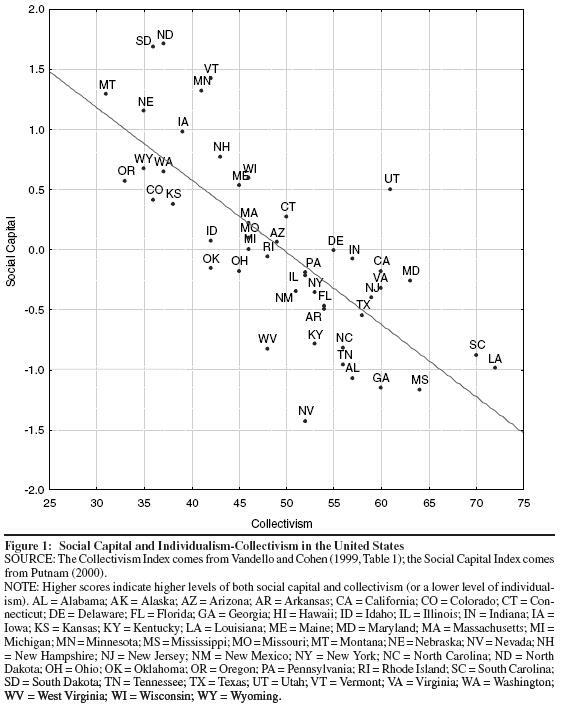 If correct the positions of a lot of countries on various individualist vs collectivist graphs will both depend on the time they have been under the model and on their respective urban / rural splits and you might expect anomalies to result from testing only the urban or only the rural population. Only if *everyone* is like that. If you import collectivist sub-populations into an individualist population it all breaks down. Except in the extreme cases where you get libertarianism. But that is very much a minority position held by a few intellectual crazies is it not? More troubling is the behavior of those new “persons” in our societies known as private, joint-stock corporations. They have not sense of loyalty or commitment to any country or part of the world. I DO NOT BLAME THEM FOR THIS. They only play by the rules and do what they have to do to survive in a highly competitive international marketplace. IT’S THOSE WHO SET THE RULES WHO ARE ULTIMATELY RESPONSIBLE. Do you know who they are? It is interesting that China is an outlier – it has one of the highest levels of interpersonal trust, despite having the lowest level of individualism. It is much further from the curve than the other East Asian countries, South Korea and Japan. We could scratch our heads and ignore the data point, except for China’s very large population and its economic importance. We need to understand why China bucks the trend. they definitely seem to work very hard at it — building up trust that is. will have to learn more about the chinese (tall order! ), not to mention think about it a lot more. if anybody has any ideas…. and, as if on cue…. interesting! thanks. i wonder what year(s) the inductivist looked at — or if he just looked at them all. i’ll have to take a look one of these days. i dipped into the world values survey looking for trust data before and came up with this — not a lot of muslim countries showed up in the results, tho. Could you tell me for each whether you trust people from this group completely, somewhat, not very much or not at all? heh. the drop-off in trust is much greater for the chinese. I don’t trust social science data out of China. Would you tell the truth when 25 mil had been killed by the govt in living memory? I would also note that the states you see as Scots-Irish and border reivers are also the most heavily black states: 20-35% That has to affect the data. I love DHF, but his numbers often skated past that. I blame Brandeis. For the rest, I agree with GW. A network of 50 weak positive connections is superior to a network of 1 strong one. But maintaining that 50 takes more intelligence, social understanding, and abstract moral values. It’s self-reinforcing. yeah, absolutely. still, it’s interesting that the nation data (the first chart) and the u.s. state data (the second) do seem to reinforce one another. for instance, ireland and northern ireland are much lower than great britain on individualism — although they do score as high, if not higher, than great britain on trust. but, then, there are a lot of minorities in great britain…. no, i think that jews — even european jews — are going to prove to be more clannish (and, therefore, particularistic) than individualistic (and, therefore, universalistic) (although western ashkenazi jews least clannish of all the jewish groups). when i said “group” there i mean the entire population — like the english are oriented towards the entire commonweal of england — even britain — h*ll, nowadays even europe or the entire world! they are not just focused on their own little subgroup(s). I think Jews may turn out to be a bit of both. On the one hand – as far as i know anyway – they had the same pattern as Northern Euros, exogamous marriage within an endogamous limit, except the boundary was religion rather than geography but at the same time in a lot of cases they would have been in situations where a small group lived in a certain town or city for a long while and inter-married among that small group. So i wouldn’t be surprised if some followed the collectivist pattern and some the individualist one. It’s been clear for a while that if the basic idea is correct then the East Asians seemed to have figured out a different method from Europeans of getting to a similar place – in terms of effective large-scale co-operation. I think the extreme drop-off in the numbers is indicative of something. One of the thoughts i had was if a society was so clannish it arranged itself such that the average person only rarely interacted with someone not part of their clan group then you might get a distorted response like the Chinese example. So that leads to the idea of a DIY clannishness without the actual familial clan – as an actual familial clan is by definition size-limiting as you can’t be *closely* related to enough people to run a corporation. Looking at it purely from the outside – you’d probably need to be Chinese to be sure – i think you may have hit it: artifical clans. The individual vs. collective issue is quite fascinating to me. Largely because I am an American living in Japan. It may seem counterintuitive, but I often find East Asians to be quite introverted and, frankly, selfish in their behavior. Very reduced concept or awareness of others or “Others”. Dr. Mahathir Mohamad (2008) made an interesting point that Asians generally do not have the Socratic command to “know thyself” built into their cultures as Westerners so there is actually a reduced perception of the self as a separate entity and by extension recued perception of the attitudes and feelings of others. Still, proof’s in the pudding and the East Asians generally are rather successful on many levels. Scratched my head for years in Japan on that one. Sure, but even ancient Greece appears to have had lots of individualism. As for individualism, it could be added that this appears to self-regulate itself. Scandinavians – with the blessed Finns excepted – are very trusting and naive and allow for mass immigration which then eventually makes individualism and trust vanish. It seems there is a similar situation in America too. And ignore the orthodox. They just think they’re running things. It may seem counterintuitive, but I often find East Asians to be quite introverted and, frankly, selfish in their behavior. Very reduced concept or awareness of others or “Others”. but the idea I like best is that individualistic societies are, rather than societies chiefly of people with rudimentry and perhaps slightly autistic (sorry, as this is probably not quite the right concept) societies, are societies where people have to “choose and be chosen” to fit into groups. and where it is “choose and be chosen” people are motivated to behave altruistically or at least mutualistically to others to be included in groups and reap the benefits of group membership. they can also form communities where other people with similar personality traits and interests can discuss ideas openly. of course, there is also the dark side of “choose and be chosen” which is about deception and manufacturing an image and being able to cast our members of the group who don’t agree with some particular groupthink. Also, a thought which strikes me is that individualism might be cognitively more complex than collectivism – individualism has a dynamic social environment where there are many more “agents” and where manufacturing and presenting a certain self image has a lot of importance (as opposed to a static environment with few agents). So there might be a parallel path to collectivism among world populations – some are collectivist because they generally have low cognitive resources, while others, the East Asians, are collectivist because although cognitive resources is high, it is more devoted to more cerebral matters. Also, hbdchick, another idea that’s kind of a tangent to this (and I bet you’ve addressed this before), but when it comes to inbreeding and trust, what do you think about a reverse causuality? I.e. people inbreed because they don’t trust strangers enough to enter into business and mutual protection relationships with them (which, plus kids, marriage effectively is in many societies), rather than that have low trust because they are inbred and so have evolved to want to boost their relatives fitness more (and dislike of strangers helps with this). What do you think would be a good test between these two ideas? I would think that in the former model (trust -> outbreeding), declines in violence which lower the consequences of betrayal and legal instruments to improve trust would tend to lead while in the latter model (outbreeding -> trust) legal instruments and declines in violence would lag (but I’m not too sure about this). Interesting thoughts there. I see as a matter of default settings. East Asians “officially” are collective in nature and part of that is the involuntary nature of much of their culture. Their default settings (in absence of official cultural values) seem quite selfish and myopic to me. i think jews are going to prove, in general, to have had a greater amount of close marriages (cousin marriage, for instance) than the surrounding gentile populations — see here and here for instance. (plus the rather closed population.) plus, some european jews more than others: i’m betting that eastern european jews (like the hasidim) had a LOT more close marriages than western european jews — and sephardic jews, too. “mitterauer drops a hint that medieval jews became concerned about inbreeding along with christians in europe…. so, the more outbreeding, western jews became comparatively less clannish (i.e. reform judaism), while eastern (and maybe sephardic) jews kept on being clannish. My girlfriend is Chinese. Her parents were immigrants. Most of her high school friends are first generation. They won’t be forthcoming when you first meet them, but after enough time they’ll start to be candid. At one dinner, one of her friends was relating a story about how one Chinese family in their hometown screwed over another, and one girl turned to me (the only Anglo of six at the table) and said unprompted, “You can’t trust Chinese.” I laughed, thinking it a self-effacing joke, but everyone else at the table just shook their heads ruefully in tacit concurrence of the girl’s advice. Derbyshire explicitly labelled China a low-trust society in an article he wrote a few months back about Chinese drinking culture. I think China’s score in the above study should be interpreted with caution. not as much as we like to think, i think. ancient athenian society was very much built around extended families/clans. for instance cleisthenes, who greying wanderer mentions above, came from the powerful alcmaeonid family — and i’ll bet anyone $1.00 that cleisthenes was not just trying to be a nice guy with his reforms, but that the aim was to (at least in part) benefit his own family in some way — to keep them in power somehow. (call me cynical.) after all, with his reforms (iirc), he gave all sorts of lowly farmers outside of town the right to vote — they backed him then, of course — that had to have benefitted him and his clan in the ongoing power struggle with other athenian great families. ** the alcmaeonidae certainly don’t seem to have disappeared after cleisthenes’ reforms came into play. **gee. it’s just like … hmmmm … importing a bunch of different people into your country and giving them the right to vote just to keep yourself in power. now, where have i heard of that ploy before…? Foreign formula brands are treated as luxury goods because of distrust for the local supply chain, said Stuart Roper, a professor at Manchester Business School. Interesting stuff! It would seem that blacks are something of a counterexample to this pattern. They are extremely individualistic but not particularly civic minded or law-abiding.